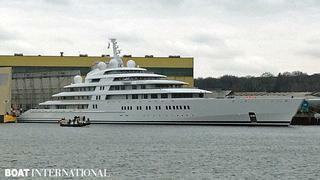 At last we finally got a proper look at Project Azzam, the 180m superyacht launched officially by Lürssen this morning, believed to have been built for the Abu Dhabi royal family. After months of speculation, the world’s largest private yacht broke cover, and we have exclusive first pictures of her launch. We can reveal that the exterior design of Project Azzam comes from the boards of Italian design house Nauta Yacht Design. Nauta’s Mario Pedol recently told us: ‘the 180 metre motor yacht recently revealed at Lürssen Shipyard is our exterior design, from the waterline to the top of the mast.’ The interior design, which includes an open-plan main salon measuring 29m by 18m, is by Christophe Leoni. We will have more details of Project Azzam in due course, but as you can see from the photos, she is significantly larger than the 162.5m Eclipse, which currently holds the title of the world’s largest yacht. One of the remarkable aspects of Project Azzam is that her four engines (two diesels and two gas turbines), linked to water-jets, produce 94,000hp and give her a top speed of 30 knots. Project Azzam left her building shed in May 2012 and was transferred to the large floating dry-dock at Lürssen where she was fitted out. She was expected to be launched at the end of 2013, but this week the German yard started to dismantle the roof of the shed in readiness for her launch today. Lürssen surprised everyone with the speed at which Topaz was completed, and the yard seems to have excelled itself by getting Project Azzam ready for launch in 10 months. Burgess Technical Services was appointed as the owner’s technical consultants and project managers in the very initial stages of design. Stay tuned and we’ll provide more pictures and details of this impressive project.